NO one’s certain how old the giant horse chestnut tree is, but one thing is certain it is big. 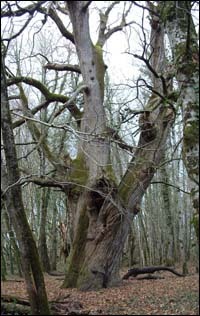 As you walk through the wood you soon spot the large base of the tree from afar. When you arrive at the clearing the first thing you do is walk around it and say ‘bonjour’. The tree has three main branches that stretch high into the sky and the gnarled, twisted bark around its base gives it a sense of motion. 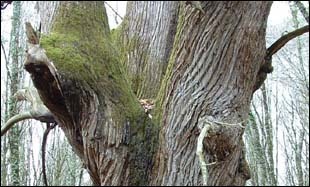 The tree is one of seven in a row, another row lies a short distance away and they were most probably used to cultivate horse chestnuts. But this tree is the only one still alive. And the tree has many friends including visits by church groups, the last one being in 2001. Around a hundred people arrived at Easter playing music and singing, causing traffic jams in the narrow roads around Villefranche du Périgord. The group held a service around the tree and erected a small marker stone inscribed with letters and the date (right). The giant horse chestnut really is a mammoth and would take at least ten people to circle it and yet you still think it is about to stride off through the woods.